It’s harvest time, the season of Nature’s bounty, when all of your hard work pays off. Any day now, you’ll be loading up a truck with your fresh goods, bringing them to market for pay day. And just when you thought you were ready to roll, you suddenly remember that your truck needs current tags & registration! What’s worse, you remember that pesky Heavy Vehicle Use Tax and that you need your stamped Schedule 1 to get your tags renewed! Well, have no fear! There’s no need to frantically drive a hundred miles to your nearest IRS office. We have a much faster, more economical solution, one that will get you that all-important stamped Schedule 1 instantly. You’ll be E-filed and on your way to the market in no time! Do I Need to File HVUT? HVUT is an annual federal tax levied on trucks or truck tractors that travel at least 5,000 miles a year (7,500 for farmers) on public highways and that have a gross vehicle weight of at least 55,000 pounds. To determine the gross vehicle weight of your truck, simply add the unloaded weight of the truck, with the unloaded weight of any trailer customarily attached to the truck, and the maximum weight of the load typically hauled in the truck/trailer. If the sum of those three numbers hits 55,000 pounds or above, then it’s time to start E-filing Form 2290! As we mentioned above, the mileage cap is higher for vehicles used in agriculture, 7,500 miles. If your heavy vehicle is used strictly for agriculture, and will travel 7,500 miles this year or fewer, then you can file it as a suspended vehicle, also known as Category W.
Notice that low mileage does not excuse you from filing altogether. You are still required to file and have a current stamped Schedule 1, even though you will not owe any tax. While there are penalties for filing after the renewal due date (September 2nd, 2014), it’s still never too late to E-file. In fact, it’s the fastest way proven to get you your stamped Schedule 1 immediately, even on the weekend! Getting started with ExpressTruckTax is simple! In just three steps and 10 minutes, you’ll be E-filed and back on the farm! Step 1: Create an Account. After entering an email and password, enter your business information, which includes the business name, address, EIN (Employer Identification Number) and phone number. Step 2: Enter Vehicle Info. Click “Start New Return” under Form 2290, then enter the first-used month. If you’ve had the vehicle prior to June 1st, then your first-used month will be July 2014. If you’re E-filing for a suspended vehicle, then under Taxable Vehicles, leave it empty and hit next. Once you’re on the Suspended Vehicle screen, enter the vehicle’s VIN (Vehicle Identification Number), the Unit Number, Gross Weight, and indicate that it’s used for agriculture. Step 3: Enter Payment Information. Select from three convenient methods of payment: Direct Debit (EFW), EFTPS through the IRS, or by Check or Money Order. Remember that the IRS no longer accepts credit cards. To receive your stamped Schedule 1 immediately, even on the weekend, elect to pay by check or money order! If you file your vehicle as a Category W, but exceed the 7,500 mile limit, we have a fast solution for that too. We also offer E-filing of Form 2290 Amendments for exceeding the mileage limit. And it’s the same fast, three-step process as above! It’s important to E-file the Amendment as soon as your vehicle exceeds the limit. Mileage amendments are due to the IRS by the end of the month following the month in which you exceeded 7,500 miles. The tax owed will be prorated based on the month the vehicle exceeded the limit. The ExpressTruckTax team supports farmers, literally! We offer year-round, USA-based support, unlike some other seasonal E-file providers out there. In fact, we get calls from farmers like you every day who need to E-file their 2290’s fast! Though the deadline has passed, we are still here and ready to help you get caught up–just in time for harvest! Give us a call in sunny Rock Hill, SC, and we’ll give you a blue-ribbon support experience! We’re available at 704.234.6005 or by live chat. For 24/7 assistance, email us at support@expresstrucktax.com. So Farmers, next time you’re in a pickle, romaine calm and lettuce help you out of a jam! We know how to treat our E-filers right. And we’ve got thousands of happy, returning users to prove it. We’ve not only designed ExpressTruckTax to be a pleasant E-filing experience. We needed to go bigger than that. back into the past and far into the future. Ripples of E-filing goodness traveling through space-time in all directions! We didn’t need a time machine (or Stephen Hawking’s brain) to do it, just our technical know-how and our passion for making your E-filing experience better than you ever dreamed possible. When you make friends with ExpressTruckTax, here are some of the benefits you can expect. We like our users so much, the benefits begin before you’ve even E-filed with us. 2290 Tax Calculator App: This free tablet app for iOS & Android Devices helps you figure out the HVUT owed, without filing! In less than 5 minutes and three easy steps, you’ll have an accurate picture of your yearly 2290 tax and a neat little email sent to you with all of the details for later. Now you can E-file with confidence, knowing there won’t be any costly last minute surprises. Smart Upload: If your account is brand-spanking new, there’s a way to upload your business details and vehicles fast! With our bulk upload, you can import data from a CSV file directly into ExpressTruckTax, making your account set up a snap. Even if you manage hundreds or thousands of trucks, they can all be imported at once. There’s no faster way to start E-filing. We’ve got the stuff to help you gain traction fast! The Support Heroes: Our support team is truly one-of-a-kind. They not only offer unparalleled USA-based support right from our hometown of Rock Hill, SC, they also do it in three languages: English, Spanish & Russian. 24 hours a day, 7 days a week, these “heroes” prove their name to be true by offering support via phone, email, and chat right when you need it most. Most impressively, they do it all with a smile. E-file Anywhere: We’re app crazy! In addition to our tax calculator app, our free ExpressTruckTax Form 2290 tablet app allows you to swiftly E-file anywhere. Whether you’re in a shop waiting for repairs or chowing down in a diner on your break, you can access our easy-to-use E-filing solution from your iOS or Android device. Our mobile site is also available for those with a smartphone handy. We know you’re always on the go; it only made sense for us to go with you! Automatic Form 8849 Generation: Does the IRS owe you money? If so, our program will automatically generate the refund request for you. All you’ll have to do is review the info and securely send it. Then wait to get paid! Convenient Payment Methods: We offer three ways to pay your taxes to the IRS. Although the IRS no longer accepts credit cards, you can still pay by Direct Debit (EFW), EFTPS through the government, or by check or money order. If you choose the latter, we’ll create a payment voucher to send with your check. We are firm believers in taking care of things for you, can’t you tell? Instant Audit: Before securely transmitting your return, our system will scan it for errors. Just one more fail-safe to ensure you E-file successfully! Notifications: Sitting on pins and needles, waiting for the IRS to decide your fate, neither of these are fun. That’s why we make it quick and painless with 4 notification systems. Whether you choose email, text, or fax (or all of the above!) you’ll know the second your return has been processed by the IRS, and we’ll automatically email you your stamped Schedule 1 too. If you elect fax notifications, we’ll fax your return to anyone of your choosing: a driver, your carrier, home office, whatever you like! We can also send it via postal mail, in case printer availability is scarce. We won’t love you and leave you. That’s not our style. Once you’ve E-filed with us once, the benefits last long into the future. Receive Stamped Schedule 1 Instantly: With a 98% approval rating with the IRS, our users typically receive their stamped Schedule 1 via email in 5 minutes. Combine that with the 10 minutes it took you to E-file, 15 minutes total is not too shabby. Good luck getting in & out of the local IRS office in that amount of time! Free VIN Corrections! If your return is rejected, or if you made an error, the Support Heroes will help you fix it asap, and in some cases, the retransmission to the IRS is free. Our heroes so dedicated, they’ll even scour your return line-by-line to find duplicate VIN numbers for you! If that isn’t heroic, what is! Retrieve Vital Docs: Any return you’ve E-filed with ExpressTruckTax is available for viewing or download from the Dashboard in your account. So next time you’re at the DMV, and can’t seem to find your Schedule 1, you can panic just a little less! Copy a Return: If you’ve E-filed with us before, you can copy a previous year’s return to the current year. The fields will magically fill before your eyes, and you can still make alterations where necessary. Just one of the benefits that save you tons of time and typing! Truck Zone: Returning users can also save time with our exclusive feature Truck Zone. Store hundreds or thousands of trucks, all in a single account, and access them quickly with our advanced search. Quickly filter through your trucks, select the ones you’d like to add to the return, and with one click, they’re uploaded. The VIN, gross weight, license plate number– all of those vital details– are stored in TruckZone forever, so you never need to type and re-type and re-type…You get the idea. Past, present, future– The benefits of E-filing with ExpressTruckTax cannot be contained. You’ll enjoy these features and more for the best value on the market. Our filings start at just $9.90! Call our Support Heroes today at 704.234.6005, and they’ll help you get started. They’re also available by online chat or 24/7 email assistance at support@expresstrucktax.com. The Stamped Schedule 1: How to Retrieve It- Anywhere! With the end of the year approaching fast, we’re entering the season for registration renewals. One of the documents you’ll need is the stamped Schedule 1. Do you know where yours is? Your stamped Schedule 1 is the golden ticket to maintaining your authority. Your entire livelihood rests on a single, fragile, highly flammable & oh-so-easy to lose piece of paper–no pressure, right?! Not if you use ExpressTruckTax. Whether you misplaced your precious paper or have no idea what it is in the first place, I'm about the break it down for you. What Is the Stamped Schedule 1? The stamped Schedule 1 serves as proof that you filed and paid your annual heavy vehicle use tax. The watermark, a faint symbol in the middle of the page, indicates that the return was submitted to & accepted by the IRS. If that watermark is missing, the Schedule 1 is not valid. It’s always a good idea to have your current Schedule 1 handy. Just keep a copy in your glove box. For instance, Canadian truckers crossing the border into the USA are required to present their current stamped Schedule 1 before they’re allowed to enter. The Schedule 1 is also needed for obtaining tags & registrations. When renewing your yearly IFTA license, IRP registration, etc, the current year’s stamped Schedule 1 is one of the supporting documents required for renewal. Luckily, ExpressTruckTax makes it easy to receive your Stamped Schedule 1, anytime and anywhere. First, we automatically email it to you as soon as your return has been accepted by the IRS, which is typically within a few minutes. You can even receive it on weekends or holidays if you E-file with us and choose to pay your HVUT by check or money order! We also offer additional options for receiving your stamped Schedule 1. When E-filing, you can choose to receive your 2290 with the Schedule 1 via postal mail or fax. And we’ll fax it to anyone of your choosing- automatically- even to your carrier to save you the trouble of doing it! But what if you accidentally delete that all-important email? Or, what if you need a hard copy, but you didn’t request the hard copy from us? Good news–It’s never too late! You can login to your ExpressTruckTax account and access your 2290 and stamped Schedule 1 any time. It’s always available to view or download right from your Dashboard. And if you’re on the road, remember, we’re as portable as you are. Login from your smartphone with our mobile site or from your tablet with our free iOS and Android apps. If you need a hard copy, but don’t have a printer, that’s no problem either! You can still elect to receive your return via postal mail or fax at any point after you E-file. To fax your Schedule 1, just login, select the appropriate return, and enter the fax number of your choosing. To receive it via postal mail, simply call our Support Heroes at 704.234.6005. or shoot them an email at support@expresstrucktax.com. Let them know your situation, and they’ll get that Schedule 1 mailed to you in a heartbeat. No matter where you’re truckin’, ExpressTruckTax makes it easy to retrieve your vital tax information, day & night, 365. Something that important shouldn’t be locked in a cabinet somewhere without a back-up. We are your back up. Paper is unreliable, but you can always rely on us. Got a bad case of the #MondayBlues? We’ve got just the thing to whip you into shape for the week! Nothing raises your spirits and helps you persevere through the work week like the promise of a fun weekend on the horizon! And with October just beginning, there’s plenty of fun ahead–especially for truckers & trucking enthusiasts! 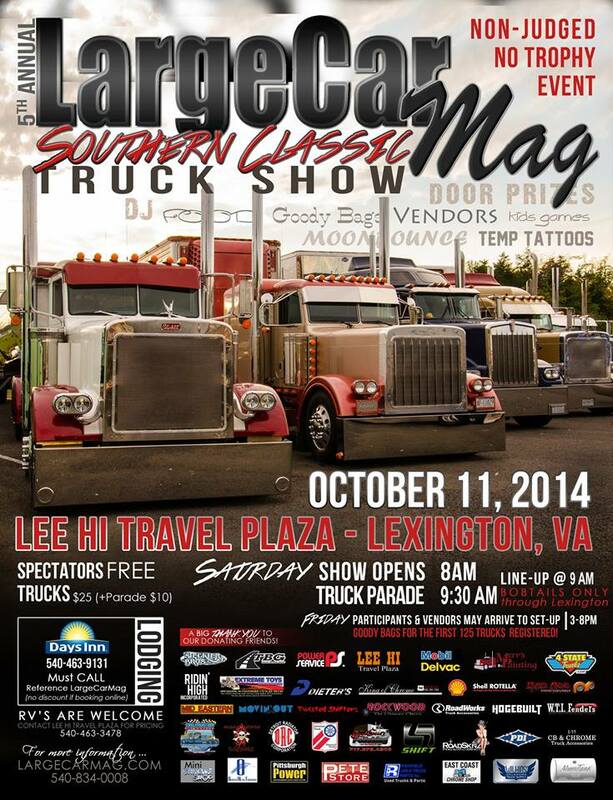 Brace yourselves, it’s time to take a thrill ride through the biggest Trucking Events of October! East coasters, head over to Lexington, VA, this weekend for this 5th annual, non-judged event. Saturday, October 11th, spring out of bed extra early to get to this event at 8am. It’s free for spectators! And bring the kids along too, there’s plenty of fun for all! Watch hundreds of tricked out, glimmering heavy haulers parade through the streets. And if you get tired of looking at trucks (is that even possible?? ), you can always enjoy the live DJ, scrumptious fried foods, and hundreds of vendors. For the kids–or for the children inside us all!–there’s goody bags, temp tattoos, games, and a Moonbounce! Got a gorgeous truck? If you’re eager to enter your Big Rig in the parade, be sure to get there Friday afternoon. The first 125 truckers on site get a free bag o’ swag! Also free for spectators, this event is a must if you love feeling the earth tremble from serious horsepower. October 17-18, head over to St. George, Utah, for this fourth annual Customer Appreciation Truck Show, hosted by Performance Diesel, Inc! If you’ve got a shiny big rig and want to show her off, get there Thursday afternoon or early Friday to join the Truck Beauty Contest, judged by Overdrive. Cash & trophies will be awarded in multiple categories! And Spectators, be sure to arrive by Friday night for the light show at dusk! Plus, both day’s events are totally free for onlookers, and they throw in a free catered lunch! On Saturday, get ready to show off what’s under the hood. Watch semi’s rev their engines to the limit on the dynamometer, “dyno" for short, to see who’s got the most horsepower & torque. You can brag to your buddies all you want, but if you enter this competition, you’ll have the stats to prove once and for all that she’s the most beastly demon on the road! And this month, nay, this YEAR of trucking events wouldn’t be complete without this last one. Peterbilt fans, start your pilgrimage to Stockton, CA, now for this three-day event. October 24-26th marks the grand finale of Peterbilt’s 75th Anniversary Tour around the nation! I was lucky enough to see the Museum-on-Wheels on it’s trip through Charlotte, NC. See the pretty pictures here! If you have yet to see this awesome exhibit, catch it before it’s too late! Perfect for the whole family, the Peterbilt Museum will satisfy enthusiasts of all ages! It features interactive kiosks, full size cabs & sleeper cutaways (yes, you can play with all of the gadgets! ), and a History Wall with a scrolling TV. But this event promises much more than a museum tour! All the staples of a successful truck event will be present: music, food, plenty of Peterbilt Trucks, and a Show n’ Shine competition! Plus the very first Peterbilt truck ever will be on display: the 1939 Peterbilt S100 Fire Truck! Best of all….wait for it….they’re auctioning off a 1976 Peterbilt 359! You could leave the event as the proud owner of a piece of Peterbilt history, and even if you don’t win the truck, it’s still a win-win. The proceeds from the raffle tickets benefit charities! I’d love to tell you more about this event, but I’m so excited I need to start packing–immediately. See you in Cali! Been to any good trucking events lately? Let’s swap stories and pics. The ExpressTruckTax team loves to brag about our customers’ rides. Send us a pic, show us the trophy you won, and we’ll post it for all the world to see! And we love it! Around the ExpressTruckTax office, dogs are a part of the family. And we know that dogs are part of yours too! There’s nothing quite like hitting the open road with a furry companion by your side. That’s why today, we’ve got an extra special blog, packed with plenty of tips for traveling with a pup. And as a bonus, you’ll feast your eyes on pictures of our puppies too! Get ready to say “D’awwwwwwww” and shriek with girlish pleasure! The Support Heroes have some seriously adorable dogs. "Is it play time yet?" If you’ve already got a furry friend, then you’re ready to move to Tip 2. However, if you’re riding solo, you can pick up a pup through adoption! Across the country, millions of pets are up for grabs at a very low cost, or even for free. So why not make a dog’s day and adopt from a local shelter. Or for a shorter-term commitment, become a puppy foster parent! You’ll take care of them until they find their Fur-ever Home. Whether you adopt or foster, be sure to choose a dog with the right personality for your lifestyle, one that is calm and collected. This shouldn’t be too difficult. Anyone who’s ever rescued a pet has seen the gratitude these pup’s have for their new families! "Dude, seriously. Where'd the ball go." Before you set out on your travels, especially on a long journey, schedule a vet appointment. Be sure your dog is up-to-date on all shots, has refills of any necessary prescriptions, like heartworm medication, and a clean bill of health. Spaying or neutering your pet is also beneficial as it results in calmer behavior. (And it reduces other risks too, if you know what I mean!) It’s also a good idea to get your pet microchipped, just in case they get away from you. Ask your vet if they have any advice for your pet in particular: remember, no two dogs are alike! And always bring the current vaccination records and tags with you, just in case. Now that you’ve got a puppy (or two! ), and the check-ups are completed, it’s almost time to get truckin’! But first, consider bringing along a crate, barrier, or doggy seat belt. These devices will keep you and your pet safe in the event of a hard stop or accident. Without them, you risk your pet being jolted around (or even out of) the cab, which is obviously no good. While crating a pet may seem cruel, they often feel safer in these confined spaces, especially in a moving vehicle. Be patient as your pet adjusts to the crate, and always speak positively about it. Never force them in or yell. As another safety precaution, find several emergency veterinary care facilities along your route before you leave. Keep their location and contact info nearby, better to be safe than sorry! "I better get a treat for this..."
Aside from the basics, like food and water, bring along stuff that makes your cab feel more like home–for both of you! If your pup has a favorite toy, treat, bed, or blanket, bring them all along! They’ll make life on the road more enjoyable for your fuzzy friend. To minimize messes, pick up a few cheap spill-proof bowls for food & water. Store dry food in a lock-top plastic container to keep it fresh and off the floor of your cab. And don’t forget to bring jugs of bottled water along, in case you can’t find water elsewhere. Finally, bring along small bags and a scoop for waste clean-up. After all, it’s not your backyard, so remember the others coming after you! Now that you’re packed, planned and on the road, here are a few more things to consider. Exercise! Your doggy needs to get out of the truck regularly (every couple hours at least), not just for bathroom use, but also to burn off energy. Take them for a long walk, or throw a ball around if you’ve got a large, safe area. "Look at me, I'm beautiful." “Car” Sickness. Dogs are very susceptible to motion sickness. Quivering, drooling, vomiting, and unusual posture are all signs of motion sickness. Avoid it by not feeding your pet during or right before driving. If this is a recurring issue, your vet may be able to prescribe medication to help. Finally, never ever (did I mention ever?) leave your dog unattended in a vehicle, especially in hot or cold weather. If you must leave your dog for a few moments, make sure the truck is on and heat or AC are flowing appropriately. In just 10 minutes, the inside of a vehicle can jump more than 20 degrees higher than the temperature outside. And that will continue to climb with each passing minute. Vehicles are like ovens. Don’t cook your dog! Hopefully, the more you travel, the more your dog will become accustomed to life on the road. Of course, some dogs just may not be cut out for that lifestyle. So take a hint, and be considerate of their needs. Some pups may be best left at home or with a friend. The ExpressTruckTax heroes hope you enjoyed the Slideshow of Cuteness! Happy travels!